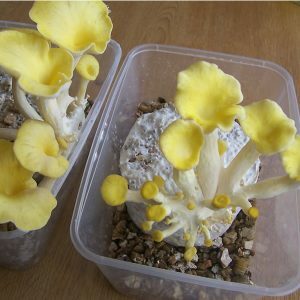 You can buy a MycoBox here. The MycoBoxTM by MycoFarm is a simple two-step kit for producing smaller quantities (30 - 70g) of mushrooms quickly and efficiently. No air pumps are needed to it is a very quiet and unobstrusive system that can be left on a bookshelf. Contents: MycoBox containing sterile substrate, tray, vermiculite, alcohol wipe, humidity bag with filter patch. Culture syringe not included. Also needed: Sellotape (cut into 4 pieces), thermometer and somewhere warm. Golden Oyster culture syringe or similar. A cigarette lighter is a good idea in case the needle becomes blocked (heat the needle until the blockage clears and then let it cool for 15-20 seconds before use). Tips: Find a clean flat surface to work on and lay all items out. Wash your hands and do a practice run before starting to make sure you have everything you need ready. Once you start you will need to work quickly and precisely. Step One: You are going to start the kit by injecting spores at 4 equally spaced sites around the top of the Mycobox (near to the edge). Swab each site with alcohol before injecting each of the 4 holes with 0.5 - 2.5mL of solution. 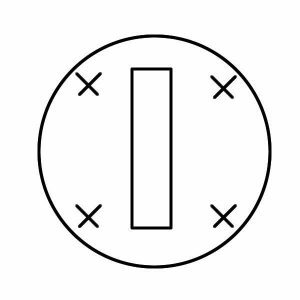 Inject as close as possible to the edge and push straight down - if you get a small crack it is no problem as it will be covered by tape (N. B. Do not twist while injecting as this can block the syringe - see MB-FAQ for how to unblock). Quickly tape over holes afterwards (with selotape or similar).That’s it! Relax. Step Two: Now you are ready to fruit (produce mushrooms). Pour the contents of the small vermiculite bag into the tray and add around 1/2 a cup of boiling water to the tray, put the lid on and leave to cool for a couple of hours. 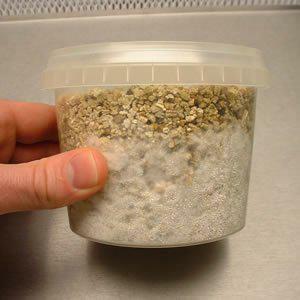 When fully cooled, drain off any excess water from the vermiculite while opening the lid slightly. Remove the lids from the tray and microbox and "birth" the cake by loosening the lid, inverting the microbox and letting it drop on to the vermiculite in the tray. 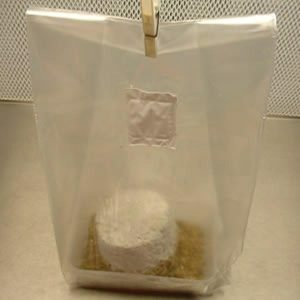 Now place the whole tray and its contents carefully inside the plastic bag and close the top with paperclips or tape. Place somewhere warm (22-24 C) which receives some light (but not direct sun). 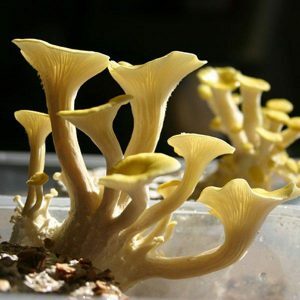 You should see mushrooms appear within 2-3 weeks. Pick your mushrooms when they begin to open their caps. Add a bit more water to the vermiculite, close the bag again and you should get a couple more crops.